All together now, plus bonus pattern! Don’t they look so festive together? 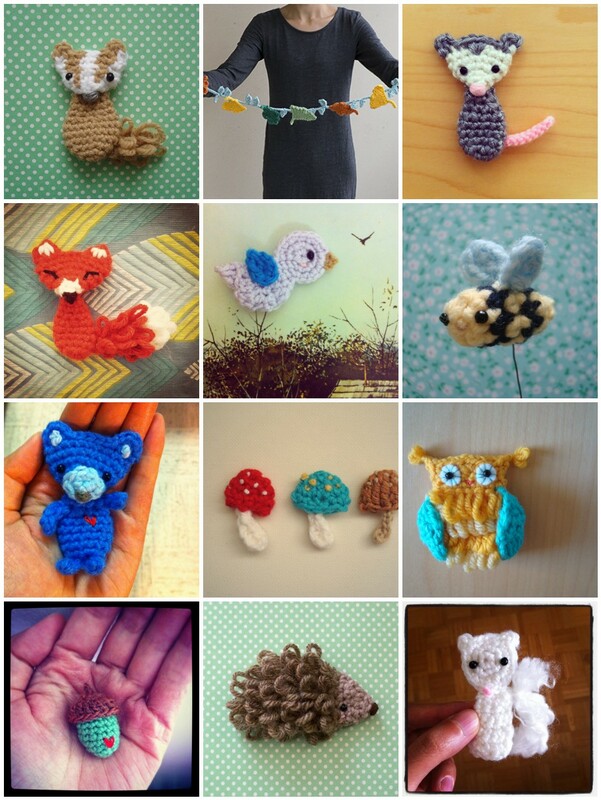 Many of us have shared pictures in the Ravelry group, but if you’re not on Ravelry or in the group you can also send me a link to pictures of your creations (if it’s posted online) in the comments below, or email pictures to me at genuinemudpie[at]gmail[dot]com. I will link your picture to your website or blog as well if you send me the URLs to them. 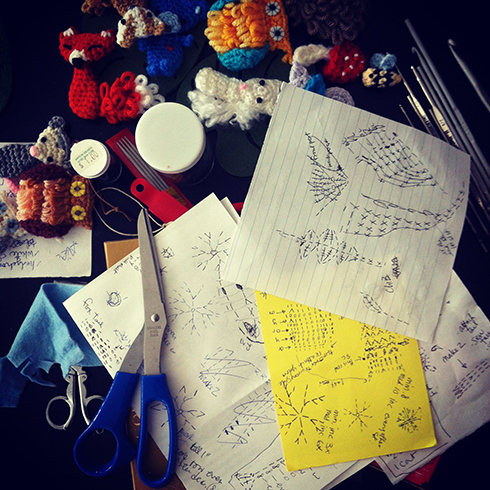 And I thought it would be fun to show you the “behind the scene” of all the written patterns — jumbled diagrams and notes on scrap pieces of paper on the coffee table. Not sure why I never use a proper piece of paper or a notebook. I always jot down ideas and stitch patterns on random pieces of paper I find around the house. So, sharing pattern here is also beneficial for me, because these scrap pieces of paper get thrown out. I just go back to my own blog posts to follow the patterns if I need to remake something. 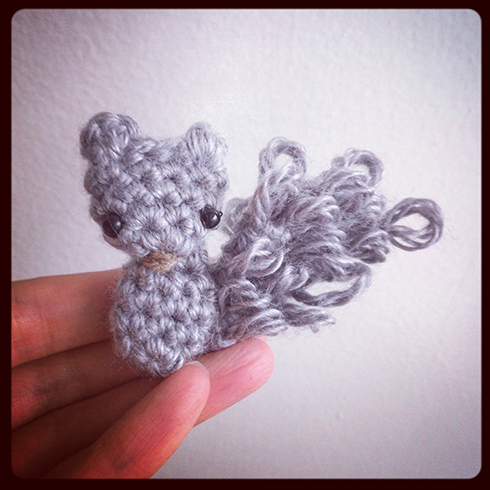 The white squirrel was one of the first creatures I made for this project, and since then I’ve developed a slightly different way to make animals, which makes the animal looks a bit more plump. And of course, the tail with loop stitch! Round 1: 5 sc in magic ring, sl st in first sc to join. Round 2: ch 1, *sc in next sc, 2 sc in next sc*, repeat from * to * once more, 2 sc in next sc, sl st in first sc to join (8 sc). Round 3–4: ch 1, 1 sc in each sc around, sl st in first sc to join (8 sc). Row 5 (ears): press head flat, with stitch on hook at the right top corner, crochet through both layers of head. ch 1, sc in same sc, ch 1, sl st in same sc, sl st in next 3 sc, ch 1, sc in same sc where last sl st was made, ch 1, sl st in same sc, fasten off, weave in ends. Round 1: 4 sc in magic ring, don’t join. Round 2: 2 sc in each sc around, don’t join (8 sc). 1 sc in each sc around until piece is 3/4″ inches tall. 1 sc in each sc around (6 sc), fasten off, leaving a tail for sewing. The tail has quite a bit of shaping using increases (2 loop stitches in one stitch) and decreases (2 loop stitches together over 2 stitches). This is what I mean by 2 loop stitch togeter (2 lp st tog): insert hook in next st, draw up a loop, insert hook in following stitch, make loop stitch as usual, and pull through all loops on the hook as you finish off the loop stitch. Row 1: leaving a long tail for sewing, ch 2, 2 sc in second ch from hook, turn. Row 2: ch 1, sk first sc, 2 lp st (loop stitch) in next sc, turn. Row 3: ch 1, 2 lp st in first st, lp st in next st, turn. Row 4: ch 1, 2 lp st in each of next 2 st, turn. Row 5: ch 1, 2 lp in first st, lp st in next st, 2 lp st tog in next st, turn. Row 6: ch 1, 2 lp st tog over next 2 st, lp st in 2nd st in the 2 lp st tog just made, 2 lp st tog over next 2 st, turn. Row 7: ch 1, 2 lp st tog over next 2 st, 2 lp st in next st, turn. Row 8: ch 1, lp st in first st, 2 lp st tog over next 2 st, turn. Row 9: ch 1, 2 lp st tog over next 2 st, fasten off, weave in end. Sew on eyes and embroider nose with brown yarn. Sew head to body. Sew tail to body. I absolutely love all your critters! Do you have them published in a book? I would love to purchase the written instructions for ALL. please let me know I’m very interested. Hi Cathy, thanks so much for your interest in my patterns! I haven’t yet put them together in a book but that’s a good idea! I will definitely consider it for a summer project… in the meanwhile, if you click on the first link in the post you’ll see all the creature pattern posts grouped together.